Probably the most anticipated announcement that Apple CEO Steve Jobs made at the annual Macworld expo this morning was that of the MacBook Air: a 13.3″, LED backlit notebook computer that pushes the concept of “thin” to its boundaries. But the one that Jobs spent the most time on, and seemed the most excited about, was the announcement of the iTunes Movie Rentals store in conjunction with the revamp of his maybe-no-longer-a-hobby-project Apple TV. We all knew iTunes Movie Rentals were coming, all that was left for Jobs to announce were the details. The iTunes Movie Rental store launches today in the US (later this year for the rest of the world), with rentals costing $3.99 for new releases, and $2.99 for library titles. Renters have 30 days to begin watching a movie, and then 24 hours to finish watching it once they do. Every major studio is on board, and Apple’s rental store launches with over 100 titles (1000 promised by the end of February), with new releases appearing 30 days following DVD release (which perhaps indicates some hesitation on the part of studios to embrace a new format — no surprise there). At first glance, Netflix would appear to have a leg up on Apple. Unlimited streaming for a little as $8.99 per month is probably a better deal for most consumers than $4 per movie strapped to a 24 hour viewing window. But where Apple’s system shines is in its convergence with other devices. Whereas Netflix can only stream to Windows PCs, Apple can stream or download rented movies to both the Mac and PC, as well as to any current generation iPod, the iPhone, and the Apple TV. Jobs said in his keynote that many companies have tried to figure out how to stream movies from the PC to the TV — Apple tried, Microsoft tried, TiVo tried, Vudu tried. All of them failed, according to Jobs. In fact, even though Jobs touted the 125 million TV shows and 7 million movies sold so far via iTunes as miles ahead of competitors, he still said they missed their sales goals. That is one of the reasons, according to Jobs, that Apple embraced the idea of rentals, and one of the reasons they revamped the Apple TV so that it could rent and stream video directly from iTunes. Jobs demonstrated the ability to browse iTunes and rent movies with a single button click directly through the Apple TV. The device can also download and stream podcasts through iTunes, sync with computer content (as before), connect to YouTube, and grab photos from Flickr and .Mac. 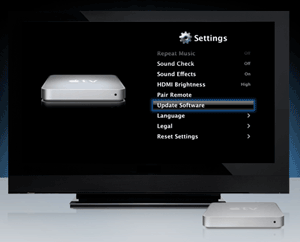 The Apple TV updates will be pushed to current owners as a free software update. To entice new buyers, Apple lowered the price of the device by $70. 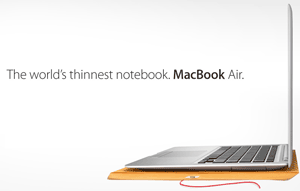 The other major announcement we all knew was coming: the Macbook Air. Speculation that Apple would release an ultrathin notebook has been flying all weekend, and Apple delivered today with one that redefines the meaning of “thin.” Clocking in at just 0.16″ (at its thinnest end, 0.76″ at the thickest), the 3 lbs. Macbook Air sports a 13.3″ LED backlit screen, 1.6-1.8 GHz Intel Core2 Duo processor, 2 GB of RAM, a 80 GB HD (64 GB SSD option), 802.11n + Bluetooth 2.1/EDR, a reported battery life of 5 hours, and no optical drive. Drawing oohs and aahs from the crowd, the Macbook Air also has a multitouch track pad that allows for a lot of new gestures — like rotating photos by pivoting your thumb and forefinger. While Jobs was clearly tickled by just how thin the Air is (he introduced it by sliding it out of an envelope and then showed a TV commercial playing off that quality), he was also clearly proud of the steps that Apple has made to make the production of the machine more environmentally friendly. It is the first Apple product with a fully mercury and lead free display, BFR-free circuitry, and due to its form factor, it can ship with 56% less packaging. All that’s remaining is to find out of the MacBook Air can help my vertical leap… (sneaker joke… anyone?). Jobs made two other major, albeit less buzzworthy, announcements at Macworld. After briefly mentioning his excitement over the iPhone SDK coming next month, he announced a handful of new apps for the device. 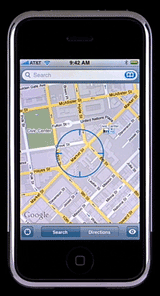 These include an improved mapping application (with location finder), webclips (like bookmarks for your phone’s home screen), and multi-SMS. The new apps are all available as a free software update for iPhone users. The iPod Touch also got some love with the announcement of five new applications: Mail, Maps, Stocks, Weather, and Notes. Inexplicably, while the iPhone gets a free update, the iPod apps (which already exist on the iPhone) will cost users $19.99. That prompted engadget’s Ryan Block to chide Apple for being, “SO weak.” Agreed. The first new product Apple announced at Macworld 08 was a wireless external hard drive. Time Capsule, as it is called, comes in 500GB and 1TB flavors and syncs wirelessly with OS X Leopard via its 802.11n base station to back up your files. The device will ship in February. Content, pricing and convenience. How do movie rentals on iTunes fare? Vert nice summary Josh. Thanks.